The rest of our trip to Montana in 2010, would be to enjoy the sites and attend the wedding that would take place in Bozeman. Our first stop, after leaving Miles City, was at the Rosebud Rest Area. It was on a cliff above the Yellowstone River and the view was incredible. I wanted to visit the Little Bighorn Battlefield again, even though I had seen it on the last trip in 2003. It is really very interesting and they are now featuring both sides of the conflict. We got their about 1 pm. The first thing was to go and hear the ranger talk. This time it was a young lady who I think was new. After, we then went into the visitor center and they said a film was to be shown soon. I looked a look at the gift shop which had a lot of books on the history of the battle, Custer and the Indians. We found seats for the film. It was an interesting presentation of the battle giving a little more detail and showing the areas that they were talking about so it added to the Ranger talk. Once that was over we went through the museum which featured some information and artifacts from Custer’s life donated by his wife who lived 54 years after his death. What the soldiers worn and used and the mix of their heritage. Some could not speak English they were new immigrants. There was information about battle tactics. They had a machine in the back that had selections on the different groups that were involved in the battle and you could search them if you new a name. They were the soldiers, the officers, the Indians and more. The had a collection of the guns that were used by the soldiers. We then walked up to Last Stand Hill where Custer was killed along with his two brothers Tom and Buster and all the others in his outfit. He is not there anymore having his remains placed at Annapolis. Others are buried in a mass grave under the big monument. When they buried them at the time of the battle they did not have the proper tools to bury them and the graves were shallow. An archaeological dig was done in the 1980’s after a fire had burned the area and they found a lot of artifacts like bullets and other things. They could track a soldier by his bullets. There is still a lot of conjecture about the battle and the maps show that with the dotted lines. We visited the Indian monument. They are adding tombstones for the Indian’s in a different color which is good. They are honoring the Indian’s and trying to show both sides of the battle at this time. I think that is a good thing. We then returned to the car to take the road to the other sites which defines the movements of the officer by the name of Reno. You drive for 5 miles along the ridge through private land. The rain was upon us by that time with a big cloud and it was not fun so we had to stay in the car. We arrived at the other end of the road and the rain opened up by then with the big cloud right over us. I did manage to get the monument and the battle plan of Reno but that was about it before it started to rain. I think that the battlefield is haunted and it is always raining when I visit. What does that mean? We arrived at the Western History Cultural Center about 11 a.m. and I figured we would put in two hours but we did about 2.5. We had to park on the street and use quarters. It was not like it had been 8 years ago and it was a little disappointing but I enjoyed what was there. They had the lady photographer’s collection. Alan had purchased a CD of her work so we have a selection of her photographs and can study them. All black and white and she was doing this at the turn of the century and early 1896 to 1900’s. Amazing dedication. The Cheyenne Exhibit was sad but very interesting. The oral histories that they have collected from the Indians is a good thing. I guess you can access them. The other exhibits were other oral histories of several musicians. There were paintings and sketches as well. They saved a sketch book of one of the Indians at one of the forts who had been shot with his sketch books with him and they are wonderful drawings, somewhat childlike but wonderful. We had to move on so we headed to Livingston arriving a the Train Depot with only fifteen minutes to view it. The other museum was closing a 5 pm as well. http://www.livingstonmuseums.org/depot/index.html My timing on this trip was off a bit. From Livingston we made it to Bozeman and found our Comfort Inn without too much trouble and settled in. The next day was Friday so we had most of the day to dally and would later go to the wedding rehearsal picnic. My goal was to find the gravesite of Armindo Spracklin the wife of Charles E. Spracklin a 1/2 brother of my great-grandmother Amarilla. The story is she wanted to be buried in the mountains so her son took her to Bozeman to live. This is what happened when we visited the cemetery, from my 2010 travel journal. Armindo Spracklin’s gravesite in Sunset Cemetery, Billings. 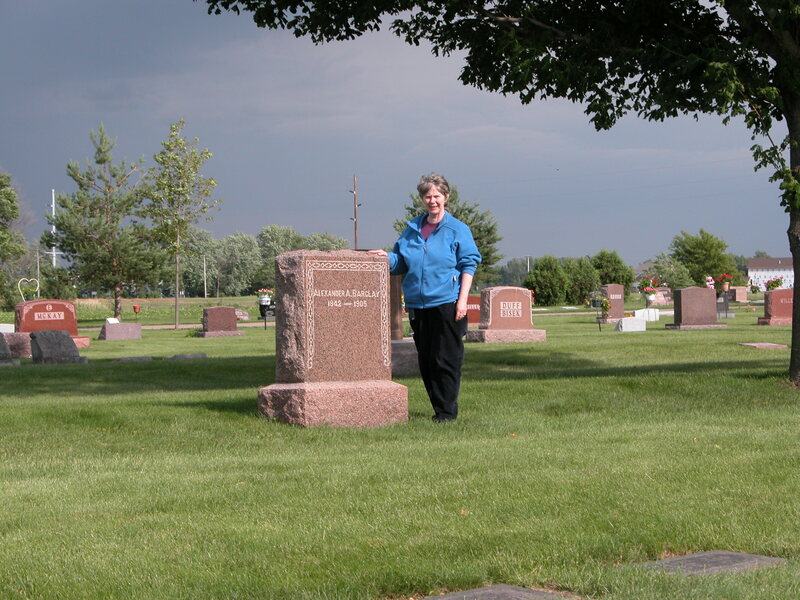 Me standing about where it would be but no headstone. We headed first to the Sunset Hills Memorial Park Cemetery and the office for the cemetery. A nice man in work clothing was in the office and he helped located where Armindo Spracklin wife of Charles Edward Spracklin was buried. He instructed me that we could follow him for it was a little difficult to find. He drove thru the cemetery gates in his big truck that had dirt in the back and made his way through the cemetery. This cemetery is huge so going to the office is a good idea. He came to an area in a shady part of the cemetery and tried to find the grave but there was no stone. He finally decided it was next to this tree and this other person. I was a little disappointed but not surprised for her husband’s marker was one of those metal tags. Find A Grave has a memorial and picture pretty much like mine for Armindo. I wish I had money to do stones for family, maybe I can work something out, but I do have a long list. Armindo made up a pedigree outline with the names and dates of our family history and I wanted to at least try to find her and pay my respects. I publish that on the Solomon Goss Blog with the title: Ancestor Outline by Armindo Spracklin, August 5, 2011. 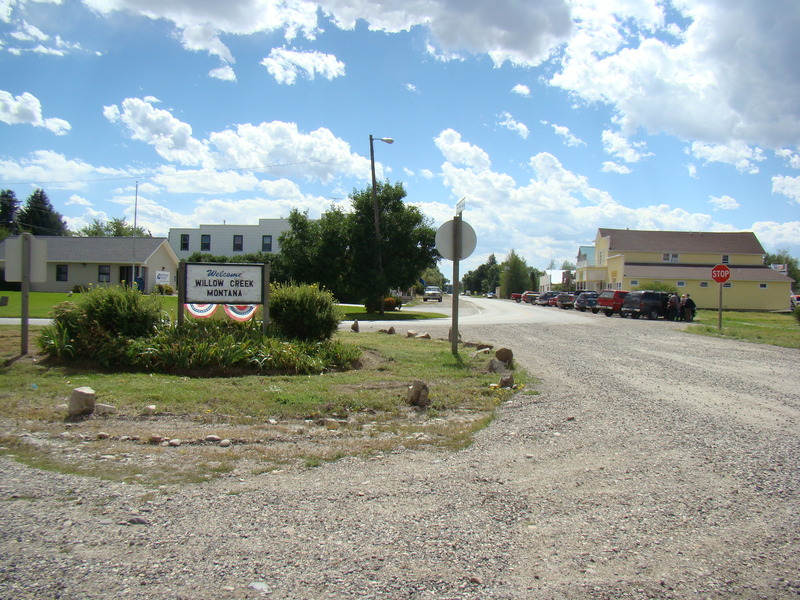 The Gallatin County and Pioneer Museum which is right next door to the Gallatin County Courthouse. We went inside and the museum was on the right and the archive center was on the left. We paid the $5.00 admission fee. I looked at books and then went into the archive area and was greeted by a nice lady but I was not allowed beyond a certain point. I didn’t prepare myself for this type of archive and should have known better. I gave her William Barclay’s name and she brought me an obituary file but I didn’t find him listed. I was thinking that if his wife had died in 1919 before him and his baby son had not survived he probably was going to be hard to find and the obituary I wanted would not be done. She showed me on the map where Pony and Willow Creek were located south of Three Forks and we will go there tomorrow when we go to the Lewis and Clark Caverns. She told me of a the Headwaters Heritage Museum in Three Forks and that they might have more local information. He was a miner and poultry farmer in Pony, then Hot Springs and then Willow Creek were he died. I tried online to see if I could find him in the cemeteries but he is not showing up. So I will need obituary notices, family histories, cemetery information in the area when I get to the historical society. The lady told me that probate and deed indexes and information would be in the courthouse and I thought about going but decided I could call or email them for his probate if there was one. He had some money and owned the farm in 1930 so he just might have given his inheritance to his brother or something like that? I then toured the museum which was on several floors and they had a chronology of the businesses in the area. A flip chart of the different communities in the county like Willow Creek which I took a picture of. Lots of information and artifacts. A map of the trails to Montana and a little about them like the Bozeman Trail. It is called the American Computer & Robotics Museum and it was on the south side of town at Kagy and 19th road in a group of buildings that looked like condominiums. We arrived with only about 30 minutes to view the museum and the nice docent gave us a quick tour around and then turned us loose to study the exhibits. It was a great museum with awards for Computer Pioneering offered to many people. They had the history of the telephone, TV, telegraph and all technologies that led up to the computer and cell phones. I teased them about a mag card typewriter and MTST which I used in my profession as a secretary. Apparently they have a warehouse with a lot of stuff in it. My hubby said they are the biggest computer museum in the country and very prestigious. We didn’t have much time but at least we now know it exits and I highly recommend it to you. We were off to a picnic which was the rehearsal dinner where we gathered at a park in Bozeman. Because I had enjoyed the Lewis and Clark Caverns so much I wanted my hubby to see them. So, the next day, we headed up to the park. The wedding was later in the day. I wrote about this visit in my 2010 travel journal. The Jefferson River Valley, Yup another river…. The scenery was spectacular. We came to Three Forks about 40 minutes later and turned south on Highway 2 for the caverns. It is a semi-circle from the west to the east. We were following the Jefferson River. There is the Missouri Headwaters Park to the north of I-90 and it is where the Jefferson, Madison and the beginning of the Missouri River meet. We would not have time to go to the park and see the rivers merge. The entrance to the caverns park has a new visitor center. We stopped to see what was there. We then headed up to the visitor center at the top near the cavern opening. I remember the climb up is about 2 miles with views of the Jefferson River valley. We arrived and immediately went to see when the next tour was and we were in luck for it was about 9:45 and the next tour was 10 am. Our guide was young man and fun. He gave us the rules and we walked to the cavern entrance. This took about 30 minutes to walk the path which is very steep. At the entrance to the caverns our guide told us the story of the man who promoted the caverns. It turned out he did not have rights to it for it was railroad land and so that began a competition of locking the entrance door and cutting the locks between the man and the railroad company. This went on till his death in 1932 when the railroad gave the land to the State of Montana. We had to be quiet the first couple of rooms so as not to scare the bats and no flash. It was really hard to adjust to the lack of light in the caverns. We entered the caverns and the stairs going down were dark, but wide enough and there were hand railings in some areas. The guide would walk us along through the caverns and then stop in a room and give an explanation of the specific room. The was temperature was cool inside. We went down stairs, through tight tunnels and there were cave formations all around. Some of the stairs were very steep and in one area we had to slide down on our butts. The formations were spectacular in each room and as we went along the rooms got bigger and bigger. The guide would turn off the lights behind us and turn on the lights ahead. They had first used wooden steps and they rotted within 2 years and now it was cemented. All work had been done by candlelight. In one room the guide turned off the lights and it was so dark you could not see your hand before you. In the last room it had these huge formations. The very last part was a long tunnel with two doors to prevent the wind coming into the cave. We were done and it was out into the sunshine again and the wonderful view of the Jefferson River Valley. We took our time getting back to the visitor center. I decided to get a hot dog to help with keeping me happy. We headed back down in the car and stopped at a couple of vistas to take pictures. We drove back the same way and turned onto a gravel road that took us to Willow Creek where William Barclay, half-brother to George, had homesteaded and died. We then went on up the road to Three Forks where the Headwaters Heritage Museum was located. We found it at Cedar and Main in an old bank building. There was a nice lady that greeted us and offered to have her son look for an obit on William Barclay so I gave her some information. I doubt I will hear from them. She did loan me the Three Rivers history book but he was not in that either. The museum was wonderful with vignettes on the upper floor of a dentist office, military sets, trains and more. It was time to return to Bozeman and get ready for the wedding. Finding the location proved to be a challenge, because GPS was not working. It was set in a lovely forested area southwest of Bozeman. The guests gathered out on a lovely grass field as the rain clouds began to gather. A little into the ceremony we started to hear the sounds of thunder. We were stoic but finally the bride gave the word when the rain started to come down. Everyone made it back to the lodge area very quickly and gathered into the area that the tables were set up for the dinner. The ceremony resumed as the rain came down outside. It was a fun wedding and most everyone was there from my husband’s side of the family. We arrived at the Museum of the Rockies which is at the south side of Bozeman on Kagy and it was a lot bigger than I expected. The parking lot was pretty much full. In the lobby we found a line waiting for tickets. I wanted to see the dinosaurs and so we headed in that direction. We only had about 2 hours to tour the museum so we needed to move along quickly. The dinosaur display was wonderful. This museum states that T-Rex was a scavenger and not a predator. Scavengers are a more common animal, while predators are not. I was not aware that they had done so much research since I was interested in Dinosaurs in my childhood. I didn’t realize that they have found dinosaur bones in 48 of the 56 counties. They had an Indian exhibit, a western exhibit which had some really nice wagons but I could not take pictures. They also had the DaVinci Exhibit we had seen before. Pretty amazing. Rather than backtrack to Billings, we would fly out of the Bozeman Yellowstone International Airport, which is north of Bozeman. http://www.bozemanairport.com/ I recommend that you go to an airport’s website because they have so much information on them and are truly helpful when you are planning a trip. It was off to the airport which neither one of us believed was really there because we could not see it from the freeway. It was north of the town in Belgrade. It is a very small airport and there are not many flights out. Again it was the propeller type airplane like the one we took to Billings. Everyone who had attended the wedding the day before was slowly trickling into this airport, so the wait was fun to have family around to visit with. After getting our tickets and checking our luggage my hubby headed to the Hertz desk to check in the car. We had done 706 miles for this trip. We headed through security and they made me take my video camera out of the camera bag. Our gate was about ten steps from the security gate. More of the family trickled in as we waited. It was decided that there were about thirteen people on our flight who had attended the wedding. It was fun to hear them chatting away as we waited for the plane. When the time came to board the plane we walked down some stairs and then climbed into the airplane. The ride was a little bumpy but we arrived safely at SeaTac and were only about fifteen minutes late. On this trip we visited with relatives from both sides of the family. We attended a wedding. Went to and walked through many museums of a great variety of topics. Took the time to enjoy the beautiful State of Montana. I was able to learn about and view several rivers and did a little genealogy research regarding my great Uncle William Barclay. As you can see my trips are busy, filled with adventures and complicated. John Barclay had two families. He was first married to Margaret. I have posted about the lives of the children of this first family which includes George and Alexander. It is now time to share about the 2nd family of John Barclay. He married Ellen (or Helen) about 1859. I have featured John and Ellen in past posts on this blog. Together John and Ellen had four children: Charles, William, Mary E. and Anna Elizabeth. These individuals were also heirs of Alexander Barclay’s estate. All of them were born in Minnesota in the area of Eagle Creek in Scott County. I will revisit the census for John and Ellen Barclay’s family, so that you can see the family unit as it developed over time. Charles Barclay first appears a 7/12 months old in the 1860 census, his two brothers are living with the family as well. If the official date of enumeration was June 1, 1860, than Charles was probably born about November of 1859. The 1900 U.S. Census has his birth date as January 1860? Dwelling 838, Family 838, John Bartley, age 48 (born about 1812), male, farmer, born in Scotland. Ellen Bartley 30 (born about 1833), female, born in Norway. Charles Bartley 7/12 mos old, born in Minnesota, Alexander Bartley 20 years old (born about 1840), farm labor, born in Connecticut. George Bartley age 17 (born about 1843), farm laborer, born in Connecticut. Source: 1860 U.S. Federal Census, Eagle Creek, Scott Co., Minnesota, pg. 97. Source: 1865 Minnesota State Census, Eagle Creek, Scott Co., Minnesota, pg. 1. 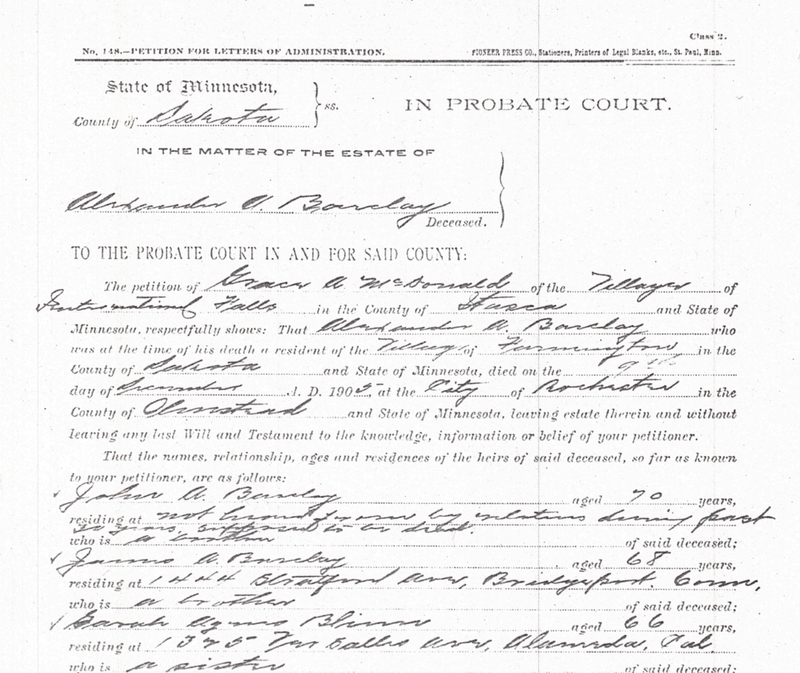 Page 13, Dwelling 81, Family 81 – Barclay, John age 50, male, white, farmer, $800 real estate, $200 personal, born in Scotland, father and mother of foreign birth, eligible to vote. Barclay,[ ], age 45, female, white, keeping house, born in Sweden, father and mother of foreign birth. Barclay, Charles, age 10 , male, white. Barclay, William, age 8, male, white. Barclay, Mary age 6, female, white. Barclay, Anna (hard to read) age 1, female and white. All children born in Minnesota. Line 8, Family 58, John Barkley, age 62, Male, white, Born in Scotland, parents both born in Scotland. Line 9, Helen Barkley, age 38, female, white, born in Norway, both parents born in Norway. Charles Barkley, line 10, age 15, male, white, born in Minnesota. Line 11, William Barkley age 13, male, white, born in Minnesota. Line 12 Maria Barkley, age 11, female, white, born in Minnesota. Line 13, Anna Barkley, age 3, female, white, born in Minnesota. Source: 1875 Minnesota State Census, Eagle Creek, Scott Co., Minnesota, FHL#565728. In the 1880 U.S. Census we have everyone there except Mary. Line 9, Family #242 Barclay, John, White, Male, age 65 (means he was born about 1815), married, farmer, born in Scotland, mother and father born in Scotland. Barclay, Ellen, white, female, age 48 (means she was born about 1832-33), wife, married, keeping house, born in Norway, parents born in Norway. Barclay, Charles, white, male, age 24 (means he was born about 1856), son, single, at home, born in Minnesota, father born in Scotland, mother in Norway. Barclay, William, white, male, age 17 (means he was born about 1863), son, single staying at home, born in Minnesota. Barclay, Anna, white, female, age 10 (means she was born in 1870), daughter, at home, born in Minnesota. By the 1885 Minnesota census only Charles and William remain at home. Family 98, John Barkley, age 70, male, white, born in Scotland, mother and father of foreign birth. Helen Barkley, age 53, female, white, born in Norway, both parents of foreign birth. William Barkley, age 23, male, white, born in Minnesota, both parents of foreign birth. Charley Barkley age 25, male, white, born in Minnesota, both parents of foreign birth, Annie age 15, female, white, born in Minnesota, both parents of foreign birth. 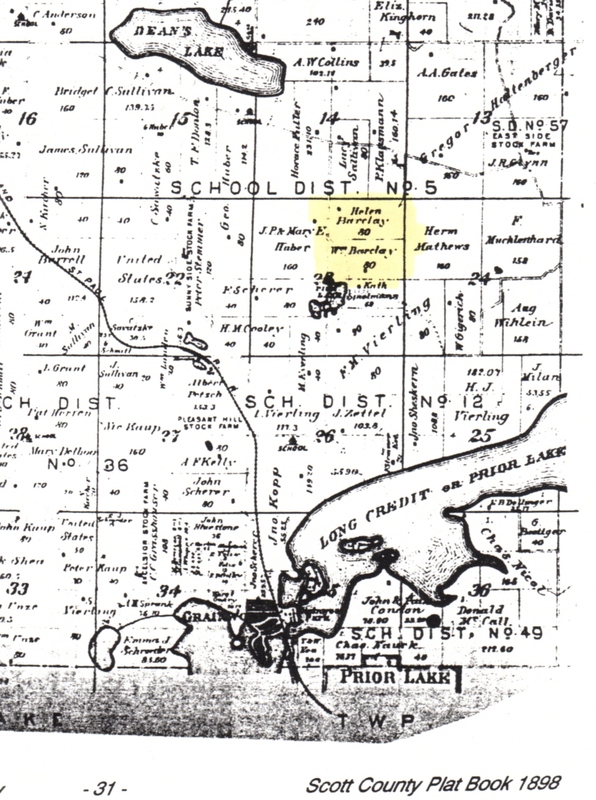 Source: 1885 Minnesota State Census, Eagle Creek, Scott Co., Minnesota, FHL #565754, pg. 14. There is no 1890 Federal census except for attempts to try to salvage it by offering other sources. So we move forward to the 1895 Minnesota state census and find the family but only one child remains and that is Charlie. We also see that John Barclay is getting very old. Source: 1895 Minnesota State Census, Eagle Creek, Scott Co., Minnesota, Vol. 47, pg. 287 #11684, Scott Co., Minnesota, FHL #1255725. On 25 December 1897, John Barclay passes away. 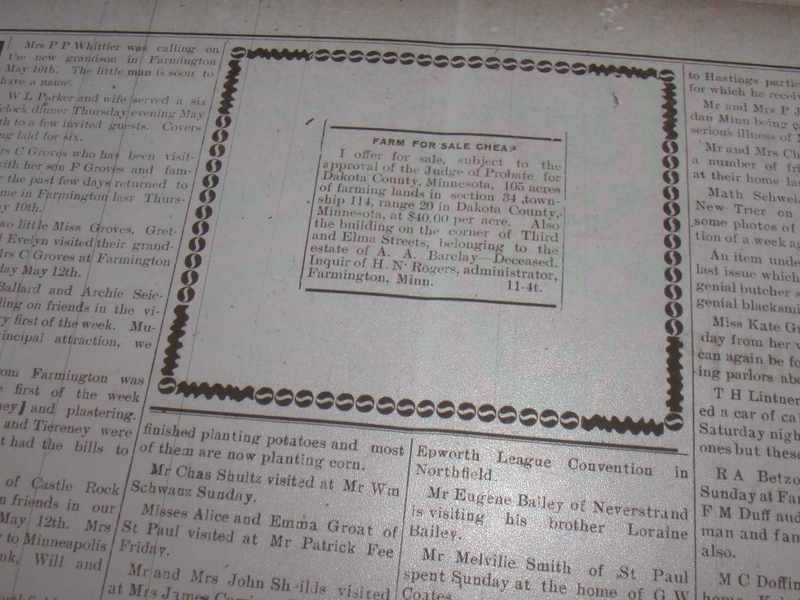 There is no estate file for John Barclay, I believe that years before he sold the land to his wife Ellen. I have written about this in past posts as well as discussed deeds between Charles, William and Ellen. In August of 1898 Ellen sells land to her son Charles and in February of 1899 William sells his share back to Charles. We find Ellen a widow in 1900 and son Charles is with her and listed as Head. I do not understand the one child born and one living. The John Carter is part of her daughter Anna’s family. 28/28 Barcley, Charlie, Head, Jan. 1860, 40 years old, single, born in Minnesota, Father born in Scotland, mother born in Norway, farmer, educated, land info. Barcley, Ellen, mother born Apr 1833, 67 years widow, one child born, one child living, born in Norway and both parents were born in Norway. Naturalized 1858, 45 years in country (means she immigrated in 1855), educated. Carter, John, Nephew born Feb. 1890, 10 years, single. Born in Wisconsin, Father born in Canada Fr., mother Minnesota, at school, 8 grade, educated. 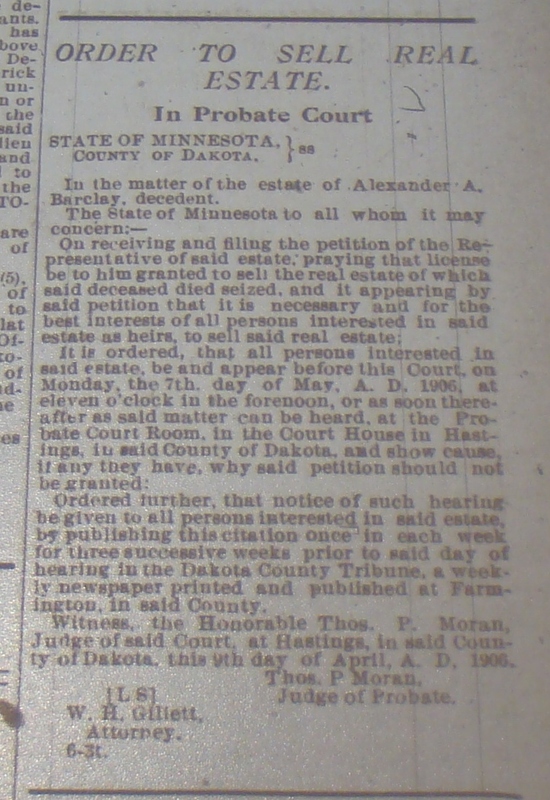 For some reason in May of 1904 Charlie moves his possessions to Shakopee. “Charles Barclay has moved his household furniture into Shakopee, and will make that his future home. Charlie was always kind and obliging to everyone and we will all miss his happy smile very much.“Scott County Argus, Friday, May 20, 1904. Both Charles and Helen/Ellen were listed in the 1905 Minnesota State Census living in Shakopee. She is 71 years old. 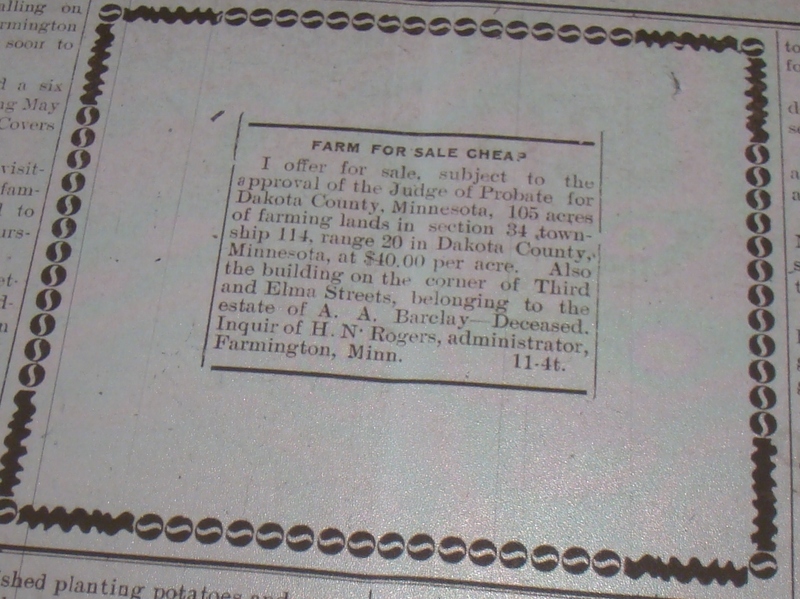 This may be why Charles moved to Shakopee, his mother Ellen was up in years and running a farm is hard business. She passed in 1907. I also believe that the 1850 date given for their marriage should read probably about 1858 but I have not been able to find the marriage record of John to Ellen. This obituary gives us clues as to where the other family members went. The only one that remained was Charles. Died – Barclay – At her home in this city, Saturday, November the 30th, Mrs. Helen Barclay of heart disease. Aged 73 years. Helen Stevenson was born in Norway in 1834, and came to this country in 1849, settling in Wisconsin, then Iowa, finally coming to Minnesota in 1848. She moved to Shakopee in 1850 with her husband, John Barclay, and was one of the early pioneer settlers of Shakopee. Mrs. Barclay leaves four children to mourn her loss. They are: Mrs. Mary Clark of Montana, Mrs. Anna E. Carter of Marynette, Wis.; and Charles at home, and William Barklay of Montana. The funeral was held from the residence, Tuesday, at two o’clock in the afternoon, Rev. Mr. Ganschow officiating. We extend our sincere sympathy to the bereaved children. Source: Shakopee Tribune, Scott Co., Minnesota, December 13, 1907, pg. 4 column 3. Charles was the executor of his mother’s estate. I have shared about Ellen’s probate in a past post. So Charles was present in Shakopee in 1907 and into 1908. From 1908 on I loose track of Charles Barclay. He did not marry during the time indicated above. Tracking a single man can be difficult. What happened to Charles? There is a possibility that he went to Hennepin/Ramsey County which is Minneapolis/St. Paul and lived there. A Charles Barclay is listed living with an Oscar and Minnie/Winnie Young/Yaung who are 36 and 28 years of age and have a son Earl who is 5 years old. Oscar is an Engineer. She is Norwegian so I am thinking he was living with one of his mother’s relatives? He is listed as 59 years old and his mother was born in Norway and father in Scotland. There is a death record of a Charles Barclay in Hennepin in 1938. Could these be Charlie? So a little more research is needed to find out where Charles Barclay ended up. 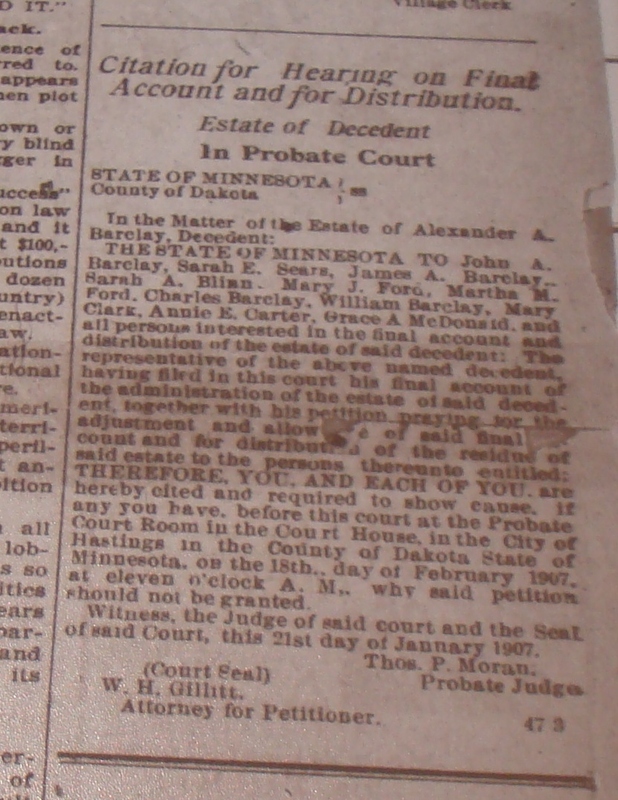 Ellen Barclay’s Will and Probate 1907, Minnesota! Ellen Barclay’s will is under the name of Helen Barclay. I, Helen Barclay of Shakopee in the County of Scott and State of Minnesota being of sound mind and memory do make, publish and declare this to be my last Will and Testament. First: I order and direct that my, Executor herein after, named pay all my just debts and funeral expenses as soon after my decease as conveniently may be. Second: After payments of such funeral expenses and debts, I give devise and bequeth unto my son William Barclay one dollar, to my daughter Anna Carter one dollar and to my daughter Mary Clark one dollar. Third: After the payment of the above bequests, by my Executor, I give devise and bequeth all the rest and residue of my Estate personal and real to my son Charles Barclay to have and hold the same to himself his heirs and assigns forever. Fourth, I hereby constitute my son Charles Barclay to be Executor of this my last Will and testament, hereby revoking all former Wills by me made. In testimony thereof, I have hereunto subscribed my name and affixed my seal the 9th day of September in the year of our Lord 1905. Helen X Barclay. This instrument was on the day of the date thereof signed, published and declared by the said testatrix to be her last Will and Testament in our presents, I do at her request, have subscribed our names thereto as Witnesses, in her presence and in the presence of each other. Jul J. Peace, Fred P. Berens. Source: Scott County, Probate Court, Final Decrees of Distribution page 4, Roll 1, Final Decrees with indexes, 1884-1968, 20 volumes, Order Book U, Oct. 1906 – Oct. 1911, pp. 265-601, Frame No. 511. In the matter of the Estate of Helen Barclay deceased. Be it remember, that on the day of the date hereof, at a Special Term of said Probate Court, pursuant to notice duly given the Last Will and Testament of Helen Barclay late of said County of Scott, deceased bearing date the 9th day of September 1905, and being the annexed written instrument, was duly proved before the Probate Court in and of the County of Scott aforesaid, and was duly allowed and admitted to probate by said Court according to law, as and for the Last Will and Testament of said Helen Barclay, deceased, which said Last Will and Testament is recorded and the examination taken thereof filed in the this office. 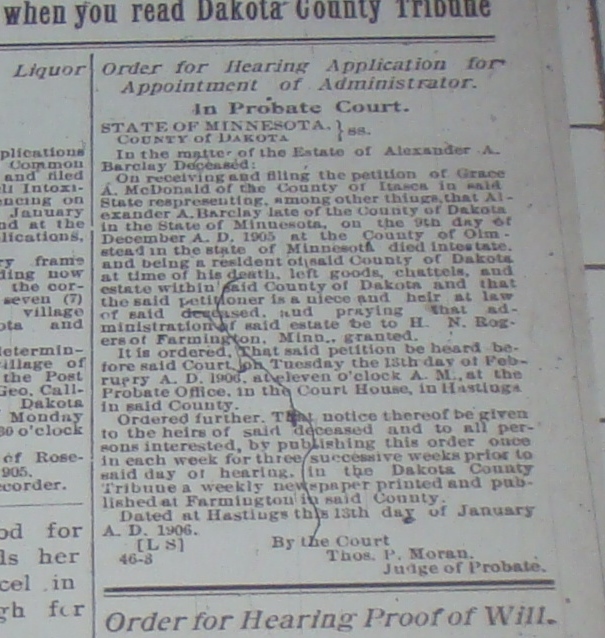 In Testimony whereof, The Judge of the Probate Court of said County has hereunto set his hand an affixed the seal of the said Court at Shakopee in the said County, this 4th day of January 1908. There was in the Probate Order Book pg. 257 a Final Decree of Distribution of the Estate. It was a form and I have summarized it here. The above entitled matter came on to be heard on the second day of May 1908…The representative of said estate appeared in person and by Counsel and no adverse appearance or objection was made. 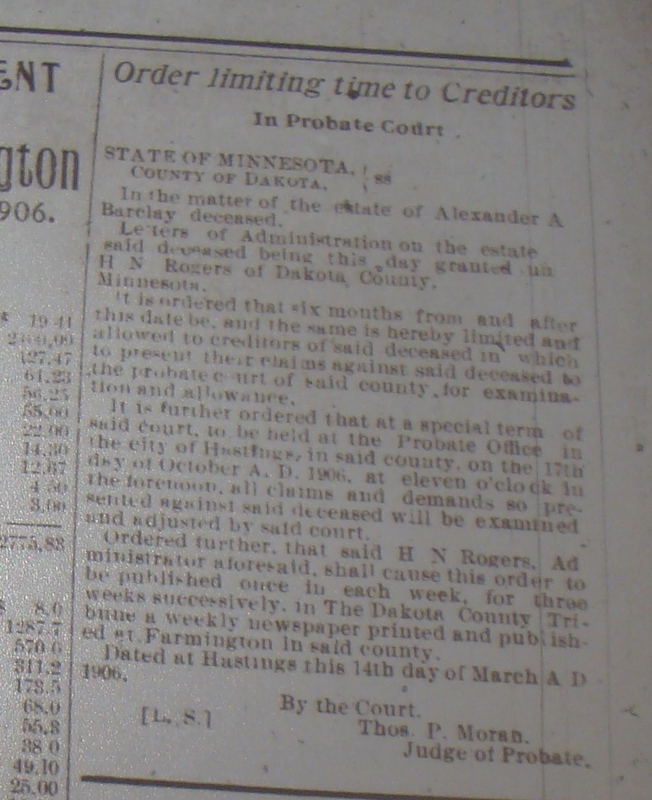 First…hearing made and filed on 7th of April, 1908 and that said citation has been published as required by law in the Shakopee Tribune. Second, all debts, funeral, burial, last sickness have been fully paid…final account herein which has been settled and allowed by the Court and that all specific bequests have been fully paid and satisfied. 1. One note and mortgage dated Feb 7, 1905 made by Thos. 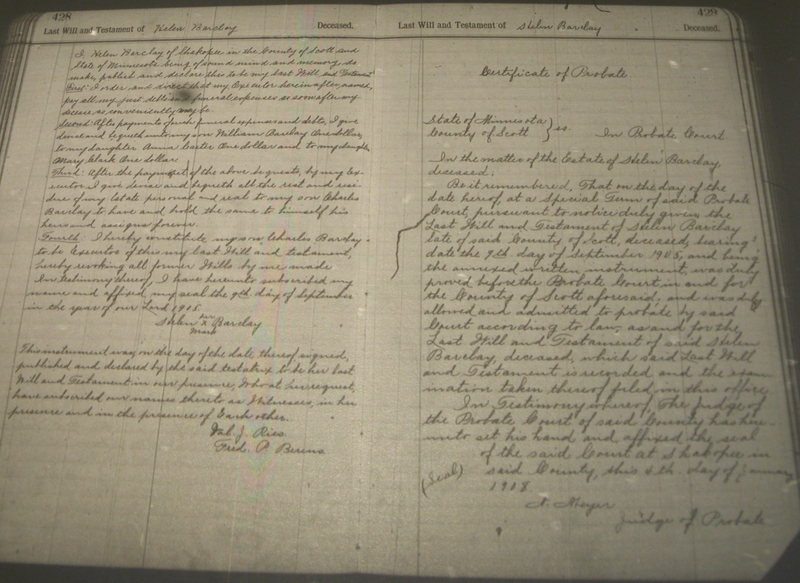 J. Shanlay to C. J. Sord, recorded Feb. 20, 1905 at 1:10 pm in the Office of the Register of Deeds of Powner County and State of North Dakota for $700.00 and assigned by said C. J. Sord to said Helen Barclay – Int. 6% due Dec. 1, 1909. (B) Real property – none. Those and other tracts or parcels – none. Fifth, That the following named person is the sole residuary legatee and is the only person entitled to the residue of said estate of said decedent by the terms of the last Will and Testament of said decedent, Charles Barclay son of said decedent. Signed by N. Meyer, Judge of said court, on third day of May, 1908. 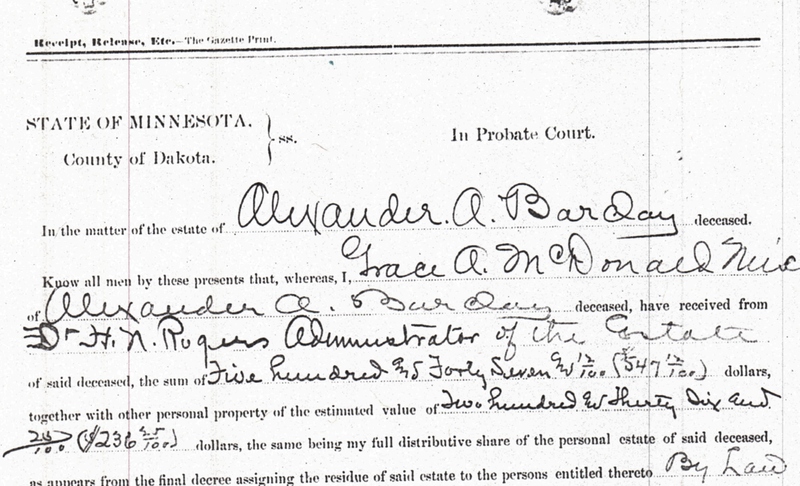 Source: Final Decree of the Distribution of the Estate of Helen Barclay, State of Minnesota, Scott County, pg. 357, 3rd May, 1908, Scott County Historical Society. As usual more questions arise when you read a will and the other documents associated with it. Helen/Ellen’s will is very interesting in that several of the children only get $1.00, but we must remember that the land John and Helen/Ellen owned was slowly sold to Charles and William. Perhaps the daughters received gifts before they left home an after their marriages. Yes, there is much more to do on Helen/Ellen Barclay and her life. I will leave that to her descendants as I am of the 1st wife Margaret and what to spend my time trying to find out more about her.